How rare is a 101 baler with 3 wire tie system. Posted: Sat Dec 27, 2014 11:09 am Post subject: How rare is a 101 baler with 3 wire tie system. Posted: Sat Dec 27, 2014 5:19 pm Post subject: Re: How rare is a 101 baler with 3 wire tie system. Posted: Sat Dec 27, 2014 6:19 pm Post subject: Re: How rare is a 101 baler with 3 wire tie system. One of our customers had a model 100 baler till a few years ago. Out where my brother inlaw lives in AZ all the square balers that size are 3 wire and bales are over 100 pounds. Posted: Sat Dec 27, 2014 7:37 pm Post subject: Re: How rare is a 101 baler with 3 wire tie system. I still bale with my 720, but also never heard of an Oliver 3 wire baler. Interesting. Posted: Sat Dec 27, 2014 9:12 pm Post subject: Re: How rare is a 101 baler with 3 wire tie system. At one time there were a fair number of Oliver Balers in our area. We had 3 and the last was a 620. Then got a JD 336 as Oliver was out of the baler business. 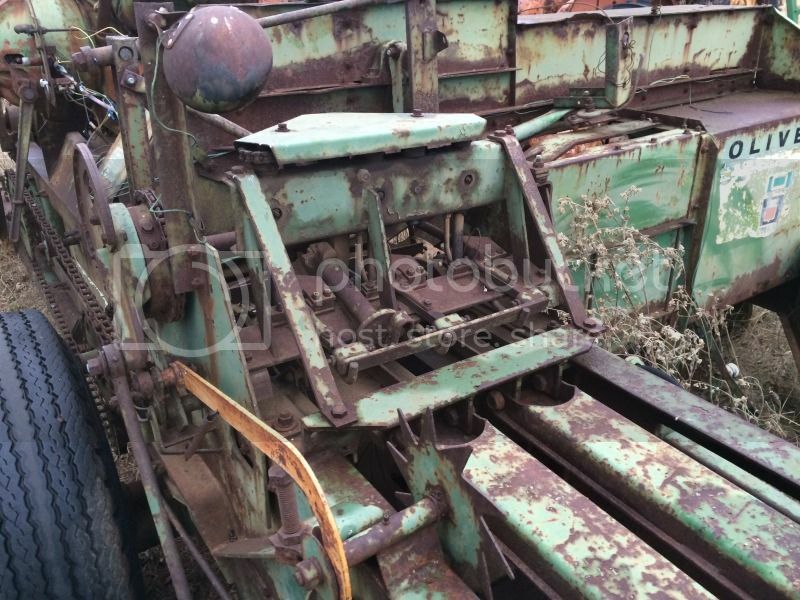 It is interesting about an Oliver 3 wire baler. I can remember back a little before that time and never remember seeing one in Western or Central New York State. Posted: Sat Dec 27, 2014 9:17 pm Post subject: Re: How rare is a 101 baler with 3 wire tie system. The more I think about if I could buy a 3 wire Oliver I probably would. It would probably need any wore or broken parts fabricated. No use thinking about it too much. If I have not run across one in over 50 years, probably will not see one. Posted: Sun Dec 28, 2014 6:44 am Post subject: Re: How rare is a 101 baler with 3 wire tie system. I need to look in some of my Oliver catalogs, but I think there was also a 102 3 wire baler for a few years as well. Posted: Sun Dec 28, 2014 7:52 am Post subject: Re: How rare is a 101 baler with 3 wire tie system. Posted: Sun Dec 28, 2014 8:45 am Post subject: Re: How rare is a 101 baler with 3 wire tie system. I have noticed that too about the older movies. Every time I see one of those movies I think must have been made by a big baler. Then say to myself can't be. I would think the three wire balers were quite pricey. Might have been a California thing selling to Hollywood. Can not imagine Hollywood types baling anything. Posted: Sun Dec 28, 2014 9:11 am Post subject: Re: How rare is a 101 baler with 3 wire tie system. Like I said below out at least in AZ the older balers are 3 wire balers. We were out there one year when the AZ state fair was going on and Budweiser had some of there horses there and all the bales they had were 3 wire and they were paying $10 to 12 a bale for good horse hay at about 100 pounds per bale. Posted: Sun Dec 28, 2014 5:40 pm Post subject: Re: How rare is a 101 baler with 3 wire tie system. Posted: Mon Dec 29, 2014 1:27 pm Post subject: Re: How rare is a 101 baler with 3 wire tie system. Posted: Wed Jan 09, 2019 6:54 pm Post subject: Re: How rare is a 101 baler with 3 wire tie system. [quote="Cas"](quoted from post at 22:17:19 12/27/14) The more I think about if I could buy a 3 wire Oliver I probably would. It would probably need any wore or broken parts fabricated. No use thinking about it too much. If I have not run across one in over 50 years, probably will not see one. [/quote]I have an Oliver 100 wire baler with a 4 cylinder Wisconson engine. 3 tie. Baled hay when parked in shed in 1975. Posted: Wed Jan 09, 2019 6:55 pm Post subject: Re: How rare is a 101 baler with 3 wire tie system.